In response to customer demand and the aerospace industry’s evolution to complex monolithic machined parts, GMW installed a 3-machine high-speed, 5-axis horizontal cell in 2014. 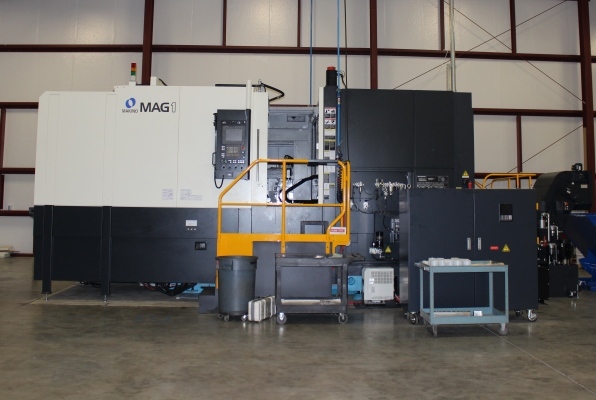 GMW added a 5-axis Makino Mag1 machining center in November 2016 for large monolithic parts. Our CNC Programmers utilize state-of-the-art Siemens NX software to efficiently convert Solid Models to minimize machining operations and cycle time. In doing so, Global Machine Works can assure our customers world-class Quality, Lead-Times and Value. By increasing these capabilities and capacities, we’re providing our customers with the highest level in productivity, accuracy and automation. Grob 550 3-machine cell with Schuler LoadMaster automatic guided vehicle.